Rose charged DEVENEY with developing a strategic approach to publicize the launch of his book with both public relations and social media in the Palm Beach area. The DEVENEY digital team conducted an extensive competitive analysis, looking at travel influencers. Some examples included World of Wanderlust, A Guy on Clematis and Hole in the Donut Travels. DEVENEY additionally employed social listening to define our content approach, pacing, conversation opportunities and positioning of Rick. DEVENEY built a social media strategy focusing on Facebook and Instagram, where it was determined Rose had most right to win amongst our affluent target audience. The social team worked within an abridged timeline to enrich content for Facebook, blog and Instagram posts, customizing messaging for each. In addition to content delivery, tonality of “Rose’s voice” was established upon the onset of the project, with guiding principles that included a sophisticated, educational but fun approach that focused on the historical elements of Palm Beach. 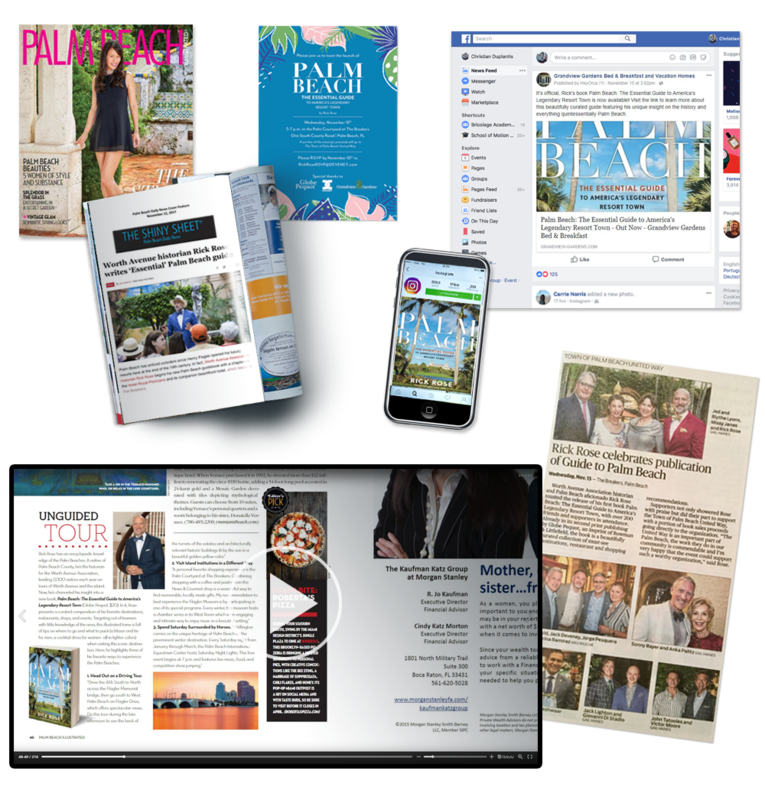 As part of our media strategy, efforts were focused on obtaining large scale feature coverage in the Palm Beach Daily News. Additional media outreach was conducted throughout the Palm Beach, Boca Raton, Jupiter and Singer Island regions. Secured additional feature coverage in Palm Beach Illustrated magazine, Palm Beach Society, subsequent Palm Beach Post party coverage in the Notables section and Palm Beach Live. Work. Play.